The word “Bhaj is derived from the Sanskrit root “Bhaj” Sevayam that means in the service of. The word Govindam one the names of the lord literally means one who protects the cow (or also humans) as an ignorant person is compared to a cow since both lack the power of reasoning and the ability to distinguish between right and wrong. 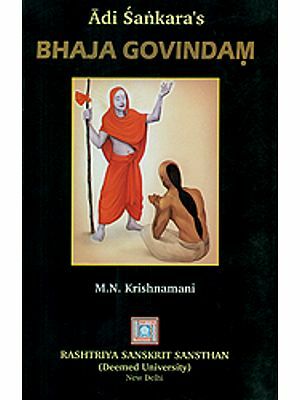 Thus Bhaj Govindam literally means in the service of the lord. The title suggests dedication of the work by Sankara to his Guru Lord Govind since in ancient Indian tradition the Guru is considered as the lord Himself in the Human Form. 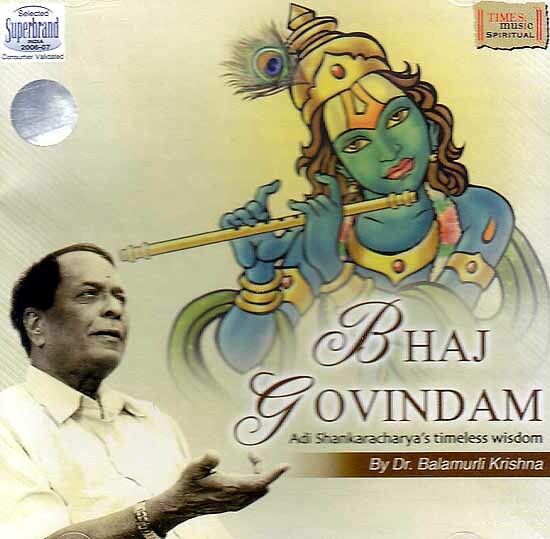 The Specialty of Bhaj Govindam is that it has a simplicity that is appealing for the novice yet it is packed with meaning that is profound. Each one of its verses points to the unreality of the many temptations of this transitory existence and ends with the recurring refrain urging us to seek Govind as the ultimate Reality. 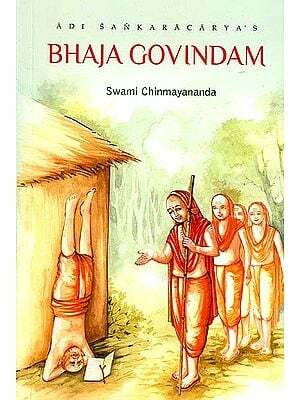 There is an interesting story behind the creation of Bhaj Govindam. 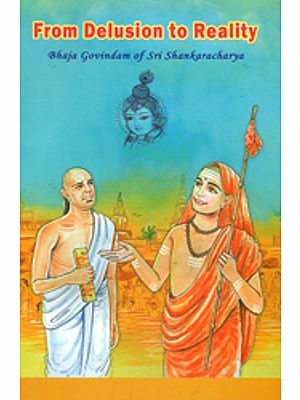 Adi Shankaracharya accompanied by his disciples was roaming the streets in Varanasi one day when he saw an aged scholar teacher the rules of Sanskrit grammar to his students mechanically. Feeling empathetic towards him Adi Shankaracharya went up to the scholar and advised him not to waste his time on grammar at his age but to turn his mind to God in worship and adoration. The hymn Bhaj Govindam is said to have been composed on this occasion. This composition consists of twenty seven verses. 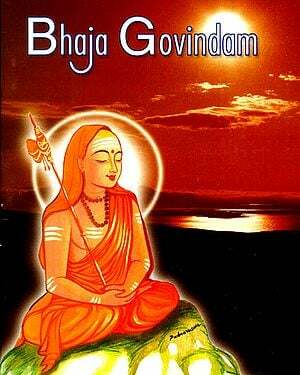 Besides the song beginning with the words Bhaj Govindam Shankara is said to have sung twelve other verses. Hence the hymn bears the title Dvadasamanjarika-Stotra (A hymn which is a bunch of twelve verse-blossoms). The fourteen disciples who were with the master on that occasion are believed to have added one verse each. These fourteen verses are together called “Chaturdasa-manjarika –Stotra (A hymn which is a bunch of fourteen verse-blossoms). Come let us immerse in the magic of these profound verses rendered in the engaging voice of the Pandit Balamurali Krishna. Manglampalli Balamurali Krishna is a well celebrated legendary carnatic music composer poet, vocalist, multi-instrumentalist and musical iconoclast who rules over the audience with his magnificently rich and wonderfully texture voice. An expert at innovation and musical improvisations. Balamurali Krishna Began his musical career at a very young age. He gained mastery over a variety of instruments melodic and rhythmic and became the only musician ever to be honoured with all India Radio’s top grade in seven different performances areas. He is an enterprising instrumentalist who plays viola Khanjira mridangam, veena and other instruments. He is also the only musician ever to have won national Awards in India for classical music, music direction and film playback singing. He sings with crystal clear lyrical pronunciation not just in Telugu but also in Sanskrit Kannada and Tamil and sometimes in other languages as well. His impressive vocal renditions combine a deep charming voice perfect control over three octaves extraordinary musical knowledge spontaneity during on stage performances and a consistently accurate rendition of lyrics. Honours have pursued this powerhouse of talent and musical energy. Nearly 400 Carnatic musical Compositions can be ascribed to him and numerous awards have been showered on him. He was awarded the prestigious Padma Vibhusan title by the Indian government the Chevalier des arts et des letters by the French government seven doctorates as of 2006, the pro-chancellorship of Telgu University and numerous top musical honours including Sangeet Kalnidhi of the Madras Music Academy. He was also conferred with the prestigious Raja Lakshmi Award in the year 1980 by Sri Raj Lakshmi Foundation Chennai. He has now forayed into music therapy and performs less frequently.